Kit in cludes FPV goggles, Controller and Tinyhawk drone, all ready to fly! Great for beginners! No extra gear needed to start flying! Real FPV, NOT WIFI. Up to 200 feet distance! Lightweight, durable, and fast! Up to 35mph! Easy to carry case, no need for a heavy backpack to carry all in one! The tinyhawk RTF is a perfect FPV drone to start the hobby, it is easy to fly and made out of durable comnponents and plastics to ensure long lasting quality. With its 3 racing modes, you will learn how to fly FPV in no time. The controller is set up with 3 diffrent modes to help you get started, the right switch on the controller is porgrammed with Level mode, Horizon mode, and Full Acrobatic mode for full control. The RTF kit includes a lightweight and durable FPV goggles. No cellphone or wifi needed, as this is real FPV that will get you much further than wifi receivers. The goggles, controller and tinyhawk will be bound and will be ready to fly out of the box. The kit comes with 1 battery. 1 set of extra propellers, and a bag of spare crews and battery connecvtor. 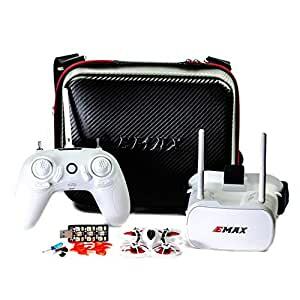 All in all it is a great beginners drone, that will get you started with FPV in the right, and affordable direction.